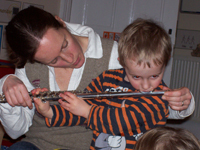 Parent Partnerships: We are lucky enough to have many talented parents at the Lighthouse who have very kindly shared all sorts of wonderful skills and experiences with the children. Some of our visitors have included the following: vet, pilot, dentist, physiotherapist, builder, doctor and a variety of musicians. Graduation Ceremony: Each July, we host a graduation ceremony on a Saturday morning for the children who are leaving to go to school and their parents. We celebrate the children’s achievements and present them with a graduation scroll and gift. Parents Open Mornings: Three times a year on a Saturday morning, we invite parents to come into the nursery and spend some time talking to nursery staff, finding out some more about nursery life and reviewing their child’s Learning Journal. Christmas Parties: Each December, we hire a local village hall and have three large parties for the different age groups. We enjoy dancing, singing Christmas Songs and Carols, play pass-the-parcel and other games and enjoy some party food. The highlight of each party is a visit from Santa who hands out presents. 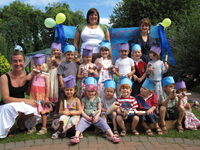 Parents also enjoy meeting other parents at these parties and many friendships are formed which continue long after the children have left the nursery to go to school. 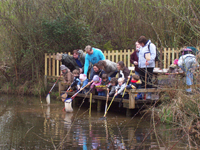 Ryton Pools Trip: Each year, the preschool children go by coach trip to Ryton Pools Country Park. 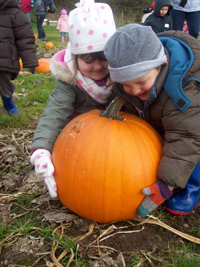 The trip is extremely popular with children and parents alike and the children try pond dipping, minibeast hunting, duck feeding, bark rubbing, go on a nature walk, play in the adventure playground and enjoy a picnic lunch. 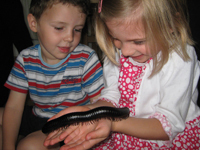 ZooLab: ZooLab are an educational company who teach children about some interesting animals. They bring a selection of tarantulas, snakes, large jungle snails, giant millipedes, tree frogs, etc. to the nursery and explain all about them. Some of the animals can be handled if the children feel brave enough! Chick Hatching: Each year at Easter time, we hatch live chicks from eggs and over a period of two weeks and we learn to care for the chicks as we watch them grow up. Links with the Community: Over the years we have established very good links with our local community which has enabled us to offer the children some wonderful experiences. The children have enjoyed visits from the Fire Brigade, The Police, The Little Green Bear Road Safety Club, a guide dog and their owner and a local MP! Pre-School children also walk to our local primary school (Milverton) to watch their school plays.